Munich has been on our radar for a long time. 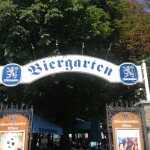 Sara and I both want to attend Oktoberfest sometime in the future, and our love for German hefe weisse beer runs deep. 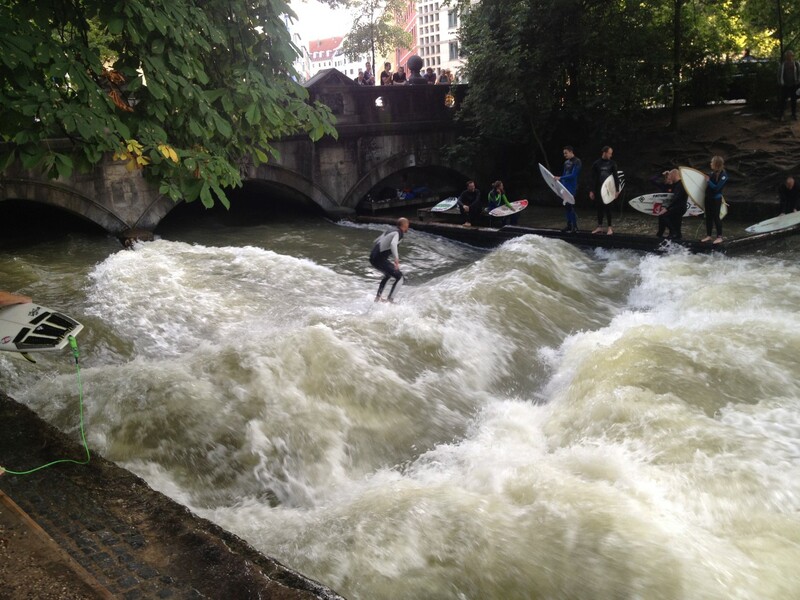 When our friend Vin (who we also traveling with in Laos) told us she was coming through Munich, we knew it was time. So, a 3.5 hour train ride later, we arrived! First impressions were that Munich is incredibly walkable, and generally more laid back than Frankfurt. People still followed the rules in a way only the Germans can, but (likely due to all the beer they drink), everyone just seemed a bit more laid back. We arrived and checked into our AirBnB, which turned out to be a college dorm room that someone was renting out for the summer. It was way nicer than any dorm Sara or I stayed at in Truman State, and had a nice, well equipped kitchen, and was in a good location, so we couldn’t complain too much. Our “host” recommended we rent bikes our first day, so we did, and set out for the English Garden, a massive park running along the Isar River that is bigger than New York’s Central Park. The highlight for us was the surf park the city installed – people could surf in the river, right in the middle of the city! The park (and all around the city) has three types of beer drinking places – bars, breweries (beer halls), and beer gardens. 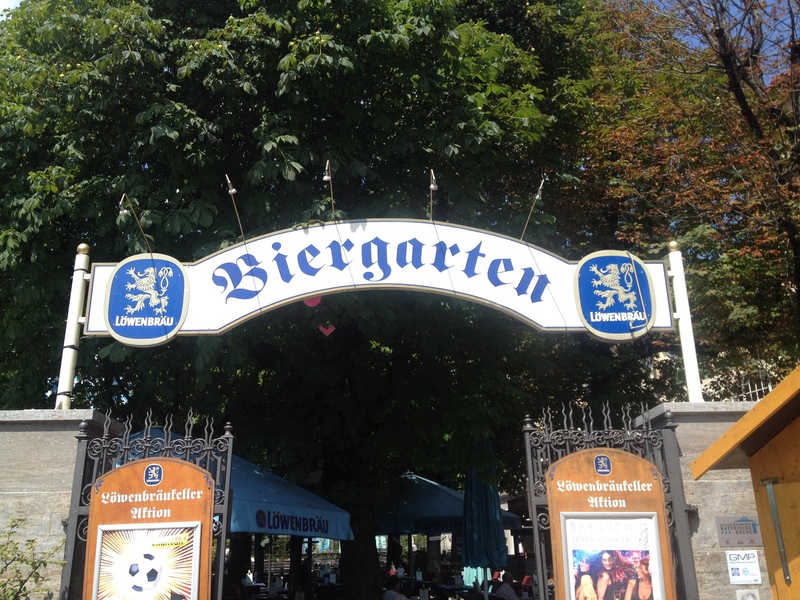 There are seven major breweries in Munich, and typically each one runs a main restaurant out of their brewery (Paulaner and Hofbrauhaus are the most famous), and also a beer garden. There are also independent beer gardens that are in a particular brewery’s “territory” and only serve that brewery’s beers. The beer gardens are very laid back, and are made up of cafeteria-style food and drink stations, and rows and rows of picnic tables. Beers are about 4€ for a half-liter and about 8€ for a liter called a mas. Food options range from a simple salad to pimento cheese dip and pretzels to a full bone-in chicken. All of it is pretty tasty, and the beer is delicious as it is served fresh from the barrel. At one point we literally watched them move barrels to the pouring station on the forklift. Our favorites while we were there were the Augustiner beer garden, and the Schneider-Weisse beer hall. Will definitely be buying those beers in the future if we see them! While drinking beer made up a large portion of our Munich trip, we did make time to see the other tourist sites. The next day after our bike ride, we rode out to Nymphenburg Palace and enjoyed the grounds there. We took a walking tour through town, which was interesting, especially to hear about the rise of Hitler and the Nazi party in Munich. Hitler first came to Munich to try and get in to art school, but after WWI and his army service, he helped lead a coup attempt known today as the Beer Hall Putsch. While the rebellion ultimately failed and Hitler was sentenced to prison (where he wrote Mein Kampf), it was quite surreal to see the places where such an influential person came into his own. We also walked through a couple of old Nazi headquarter buildings (which weren’t bombed in order to preserve their records); it was crazy to be standing in a place where Hitler and Mussolini once met. 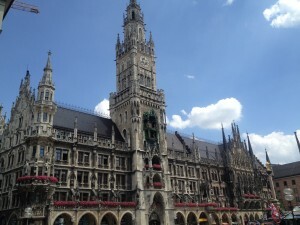 Munich also had a couple of nice buildings, including the Marienplatz, which has the famous Glockenspiel in front, and St. Peter’s Church, which has a tower you can climb up to. 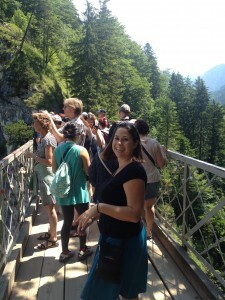 We hoofed it up all 320 steps, and were rewarded with a great view of the city and the Alps. We also timed it right so we could see the Glockenspiel do its thing from above; which not overly exciting, it was much better to watch it from above, away from the crowds. 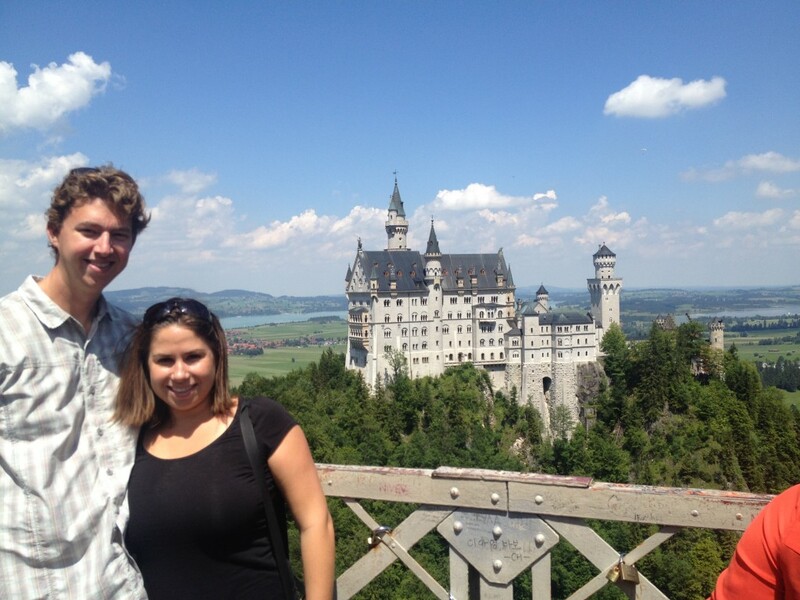 The other highlight was taking a day trip to Neuschwanstein, which has topped Sara’s must-do list ever since missing it the last time she was in Munich. Our plan was to meet Vin (who was staying across town) at the train station about 20 minutes before our train would leave. We accidentally got off at the wrong subway station, and it took us about 15 minutes to realize our mistake. We arrived at the train station with about 5 minutes to spare, found Vin, and hopped on the train right before it pulled out of the station! We had to sit on the floor the 2 hour trip, but we were happy to have made the train at all! Neuschwanstein was both super touristy and totally worth it. We didn’t book a tour in advance, and when we got there the line was over an hour long, so we decided to “self-tour”. The highlight for us was definitely the first place we visited, Mary’s Bridge, spanning a cliff above the castle. The castle is what Disney’s “Sleeping Beauty” castle, and the famous one at Disney World, are modelled after. Walking out on the bridge, you can immediately see the resemblance, and coupled with the beautiful countryside and imposing mountains surrounding it, it was definitely one of our top viewpoints we have been to on the trip. The two actual castles were a bit underwhelming, but it was worth the trip for the view alone (and for the look on Sara’s face when she finally got to see the castle). …and it was absolutely worth it! 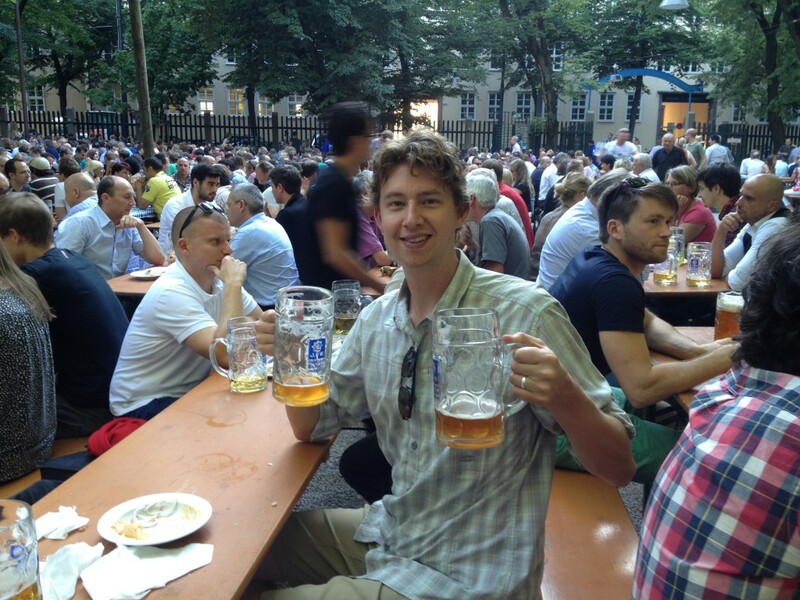 Overall we loved Munich and definitely want to return, either for Oktoberfest or just to live there for a few months. Plus, the countryside around Munich is beautiful, and seems like it would be a great place to unwind for a few days. 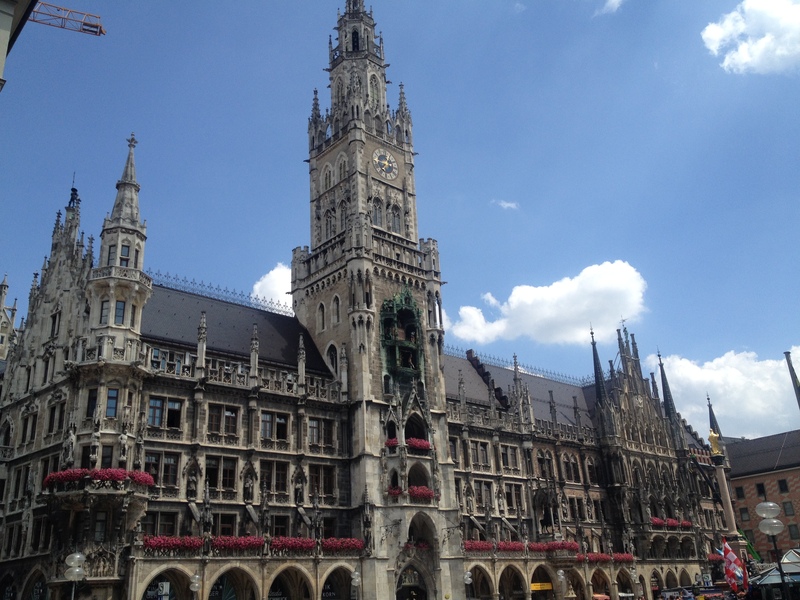 Munich has definitely been one of the top places we’ve visited, and one of the few places we’ve been we would consider moving to at some point in the future. It was a sad goodbye, to say the least. I think I could get used to this lifestyle!